When the iPad 2 was introduced in March 2011, Apple claimed that its custom-designed A5 processor had twice the processing power and nine times the graphics performance of the original iPad's A4. Other improvements included more RAM, front- and rear-facing cameras with FaceTime support, a Three-axis gyroscope, and optional CDMA support. Announced alongside the iPad 2 was the "Smart Cover", which could be used as a cover, a keyboard stand and an upright stand. The iPad 2 included magnets that allowed the Smart Cover to snap into place, putting the iPad 2 to sleep when closed, and waking it up when opened. GSM and CDMA 3G models were available for an additional $130. 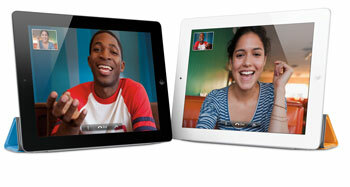 In March 2012, the 32 GB and 64 GB models were discontinued following the introduction of the iPad (3rd Generation). The 16 GB models were reduced in price to a base price of $399. They were discontinued in March 2014, following the introduction of the iPad Air, which pushed the iPad (4th Generation) into the low-end product tier.